Entered the lottery for Padova and Rome. Hotels booked...driving by car from Vienna to Padova..
how are people booking their flights already? Do you find out straight away if you're successful on the pre-sale? Tickets will be easy to come by especially GA even if you are not successful on the draw. Edit: You will out around 12:00 CET on the 5th if you won. Is it not weird that all the GA odds for the shows are still all at 99%? The odds for seating are the only ones that seem to be changing. 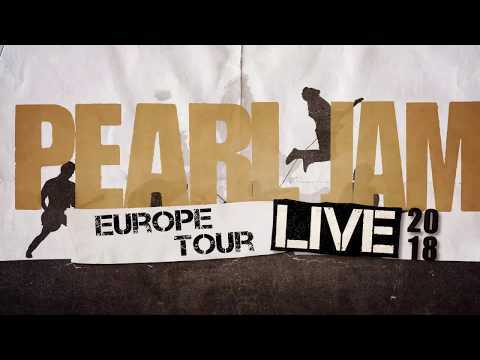 We’re excited to announce that Pearl Jam will be returning to Europe in 2018 with a 14 date tour in June and July! This tour also marks the band’s first performance in Rome since 1996 and first-ever concerts in Padova, IT and Kraków, PL. A special ticket pre-sale begins today for current Pearl Jam Ten Club members (as of November 30, 2017). For a full list of tour dates and ticket sale information, visit the TOUR PAGE. Tickets for Rock Werchter, Mad Cool Festival, and NOS Alive Festival are on sale now. Ticket information for Pinkpop will be announced by the festival in the coming weeks. Looking forward to my first GA experience in Europe!! I hope you all can get where you need to be. Its an amazing feeling that fills me with excitement as i remember doing all of this when i was more fortunate. So remember breathe every second of the whole experience in . It will stay with you forever and if anyone is in two minds, say yes. Don't think . Say yes. Bon voyage have a beer for me and make as many new friends as possible. at what time do we know if we won? (Lisbon/London time) anyone knows? Draw ends 8:00am on the 5th your time. Someone else that has done a Euro draw should answer but with NA peoples cards were charged a couple of hours after that. Not sure how this will play out since it will be midnight Seattle time when the draw ends. so around 8.30 am (Lisbon time) i should know if i won or nor right? Really depends. I doubt that early maybe lunchtime or so. There are ways to tell if you won before they send you an email. Like I said though it is midnight in Seattle so I am curious too how this will play out. Barcelona reserved or GA? Reserved is sitting @ 25% but you have better odds then that since you have it as your first choice. Hopefully beginners luck! Annoyingly the 2nd London date clashes with Foo Fighters in Manchester which I already have tickets for. 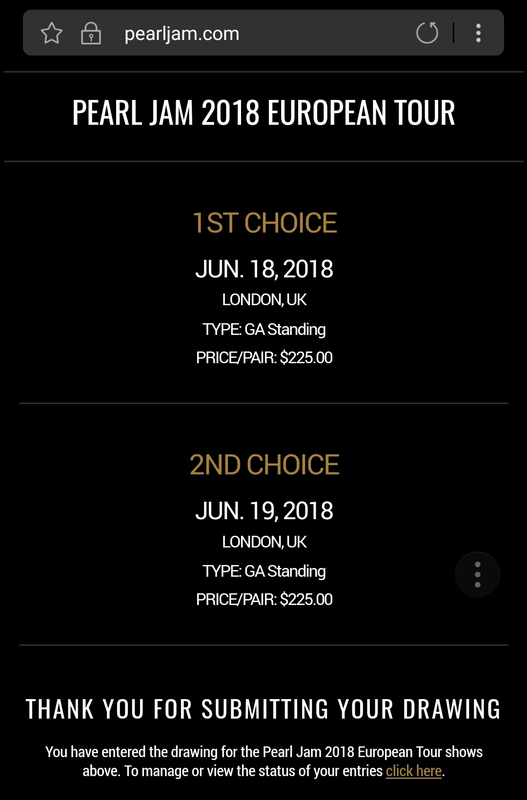 Doubly annoyingly is that having only applied for the first London date and then deciding I wanted to add Amsterdam as a second choice I there is no option to update my selection. You can cancel your entry and then start over. Takes about 2 minutes. You need to cancel your whole submission and redo your choices from the start. guys, based on your experience, how long PJ are playing on festivals? Is it a full show, or just one hour or so? Have submitted 3 choices,can I give 2 tickets to my Brother for Xmas if I dont attend same show? All booked for Barcelona! Incredible deals from Oakland direct to Barcelona if you leave July 6th and return the 13th. Non stop flights for insanely cheap prices! Holding out hope for a second show on the 9th. Regardless going to be a great trip! I have few questions regarding Berlin venue (Waldbuhne). First, I have a problem submitting entry for a ticket draw, after hitting Submit entry, for a short period it goes to Saving... and than after that nothing happens, no error on a screen nor ticket in My tickets, nothing... I was writing to support, no reply, so just wanted to ask if similar thing happened to anyone here? Also, if I ever manage to finish it and get tickets, do you know if I can enter any part of the venue with them? I having doubts as a friend I would go with does not want to be in the first rows, although I wouldn't mind, I would be veery happy with them. On a page here it says: " For Berlin, there is only a GA ticket option for the entire venue. Standing and seated general admission areas are on a first-come, first-served basis." And if I don't manage to get 10C tickets, is anyone there who knows if there are some price ranges for different tickets? Looking at the photo of the venue, there are some obviously better seats/positions and it seems all the tickets have the same price. With 10C GA you can choose to stand or sit with early entry. I've heard the 10C support has been very helpful in solving issues with the lottery, hopefully they will reply to your email soon. if i dont win i will get them on the general sale. any word on a 2nd show on July9th? I'm tempted by prague and krakow - wondering if I could do an overnighter between the two. Plus a London date - although not keen on the O2 as a venue - Milton Keynes was epic, I don't think the O2 can live up to that experience.